If this keeps up, Austin Rogers might be able to quit slinging drinks forever. 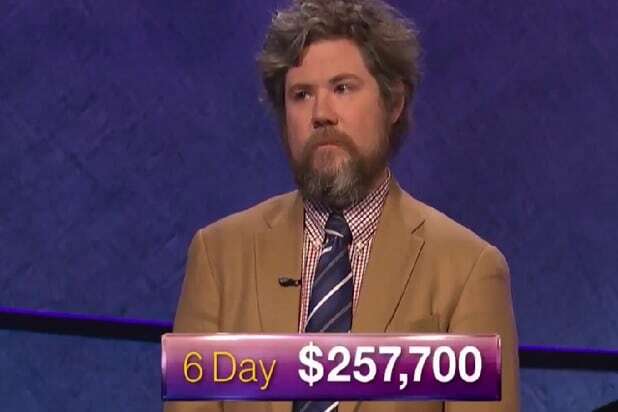 Rogers, who’s enchanted “Jeopardy!” fans during his run, wowed the crowd again and scored himself a boatload of cash during Thursday night’s episode, thanks to daring bid during the Final Jeopardy round that would have left him nearly broke had he not guessed correctly. In all, over his six-day run, Rogers has now amassed $257,700. Naturally, “Jeopardy!” fans went wild over the big haul on social media. “this quirky guy sure is a smartie pants! Thanks for keeping @Jeopardy entertaining! #Austin #jeopardy,” wrote one admirer. “Quite a payday on #Jeopardy. That may be the biggest 1-day total I can remember,” raved another. See Rogers’ big win, and some of the reactions, below. Need to be watching #jeopardy This guy is unreal! !